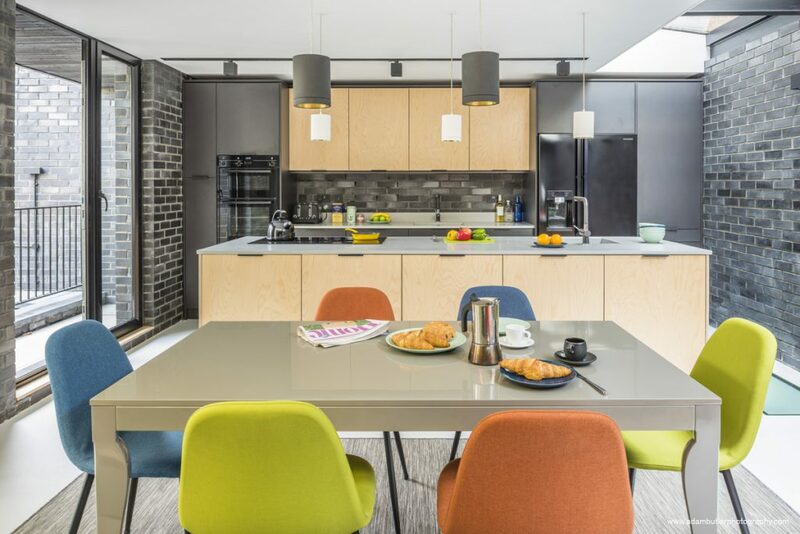 This week’s instalment of the #SBIDinspire interior design series features a bespoke contemporary three-bedroom home, which replaced a double garage on an 80 square-metre site. 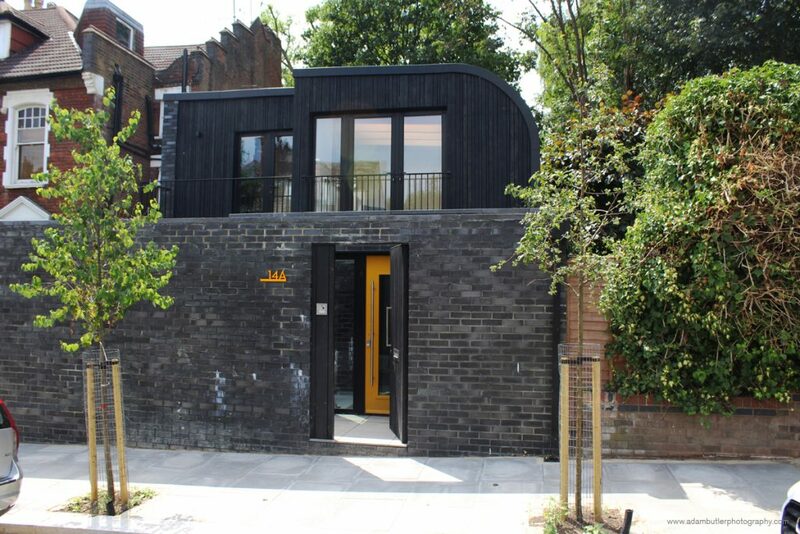 The idiosyncratic style serves to enhance the context of the street-scene with a bold architectural statement, contrasting with the context of traditional Victorian houses. 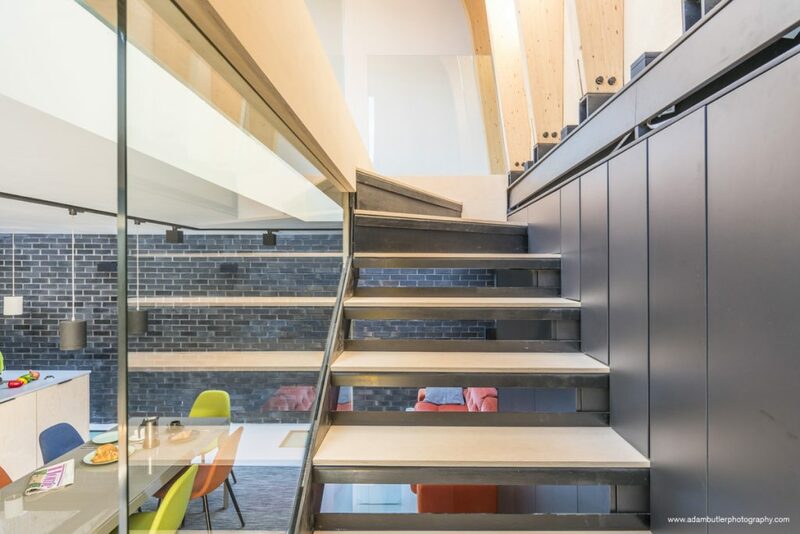 Filling the footprint of the site and set over three floors, the project was delivered on a limited budget but exceeding the client’s brief. 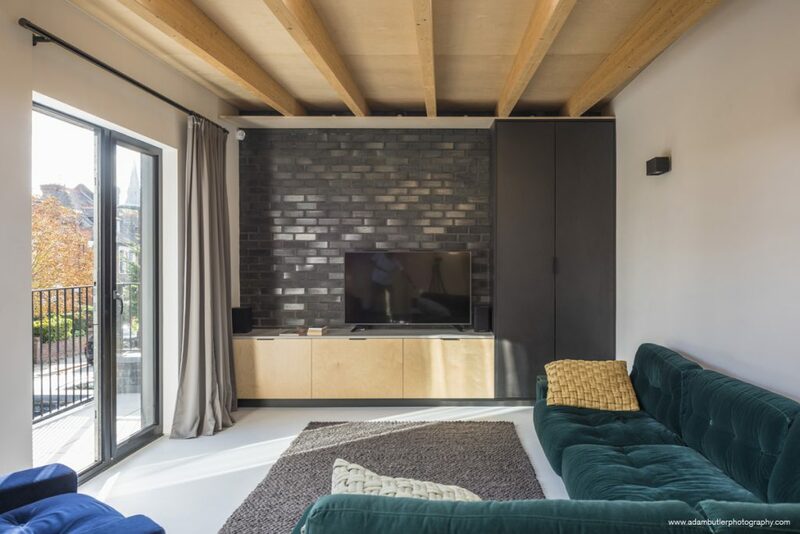 The three-bedroom home, bathed in natural light, uses a minimal palette of materials to unify the design language internally and externally. 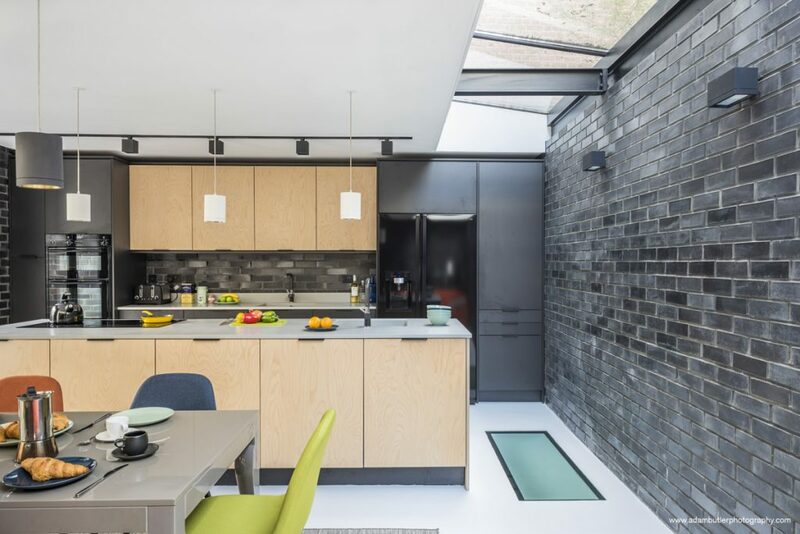 The materials used include dark brickwork, externally and internally, dark burnt larch cladding and birch-faced plywood throughout the interior for bespoke kitchen, bathroom and stair joinery elements. 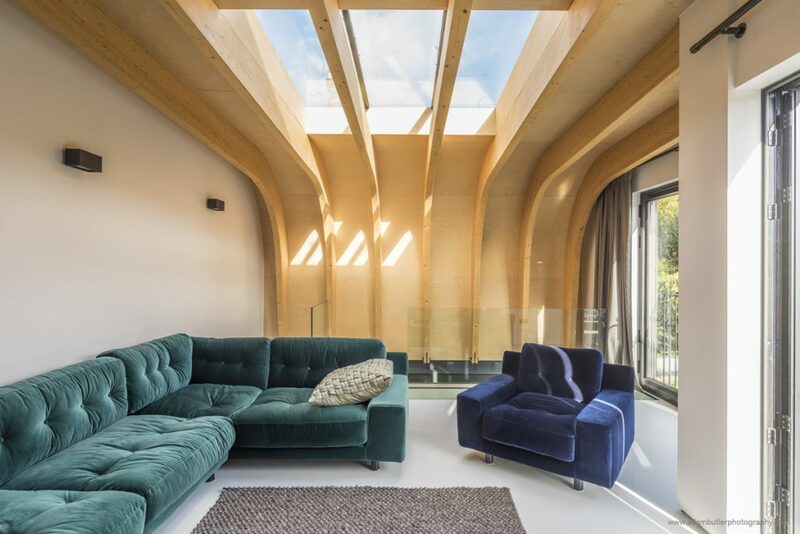 The result is a bright, bold comfortable design, confidently articulating a contemporary language of architecture used to transform the site into a unique new family home. What was the client’s brief? To design a new build contemporary three-bedroom family home on a small constrained urban infill site, formerly a double lockup garage purchased at auction, with high-quality bespoke architecture and interior design that would feel spacious and bright and would incorporate sustainable construction technologies and renewable energy installations, and all a limited budget. What inspired the interior design of the project? Our design inspiration comes from many sources, however, having an engaged client with enlightened ambitions was our main inspiration on the project. This resulted in many productive discussions about their aspirations and style preferences for the new home, which sought to challenge conventional ideas to address the many constraints of the existing Victorian surroundings and create a home suitable for 21st century lifestyle. 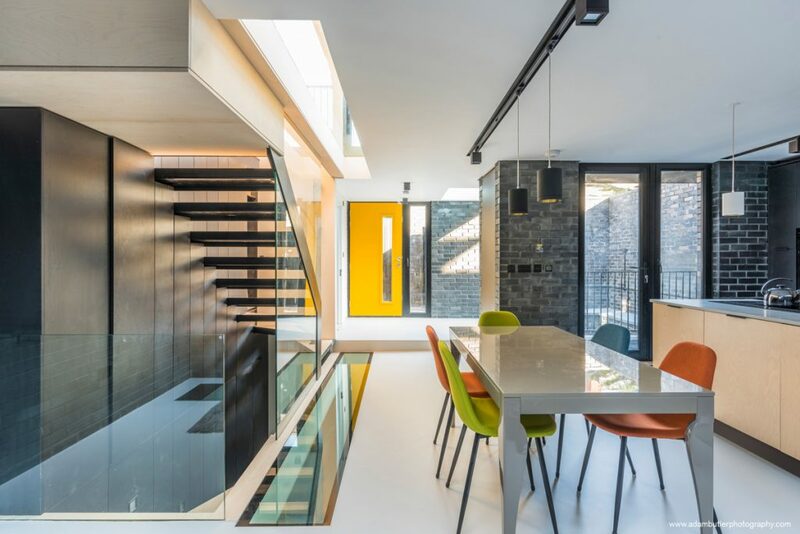 The practice’s design approach is unapologetically contemporary; providing bold and ambitious design solutions particularly when working in a sensitive Conservation Area context. What was the toughest hurdle your team overcame during the project? Achieving planning consent for a contemporary design within a Conservation Area is a major hurdle, as is working constantly to ensure that all neighbours whose homes adjoin the boundaries of urban infill sites do not experience any loss of their existing amenity during the construction works, however, the main hurdle for a designer to overcome is often providing a Rolls Royce for the price of a Mini, especially when working with a shoestring budget. For us, it is paramount to completely understand the cost implications of every decision in order to not only achieve but to elevate the client’s aspirations for their project without compromising their budget. Continued collaboration and communication throughout the initial design stages between the designers and the client, and thereafter with the contractor and sub-contractors during the detailed design stages and works on site has made it possible to attain the quality of finish and fitting out we desired, whilst adhering to the client’s budget. What was your team’s highlight of the project? Maximising the feel of space and light within this very compact three-storey home has been the rewarding highlight for us, and was achieved by careful studies of the internal volumes and limited scope for placing windows, and then by simplifying the main backdrop of finishes, both externally and internally, which are uniform and monolithic and provided at minimal cost, allowing us to then spend more of the construction budget on interior features that elevate and focus the attention on the ambiance of spaces, such as the slender, curved glulam timber roof beam structure, the sculptured open riser staircase, the bespoke kitchen and bathrooms designed by us, the geometric and monochromatic lighting fittings, and especially the variety of glazing elements incorporated that contribute to the surprising levels of natural light and sunlight that filters within all levels of the interior, providing kinetic patterns of light and shade throughout the day on the canvas of walls, floors and ceilings. Why did you enter the SBID International Design Awards? 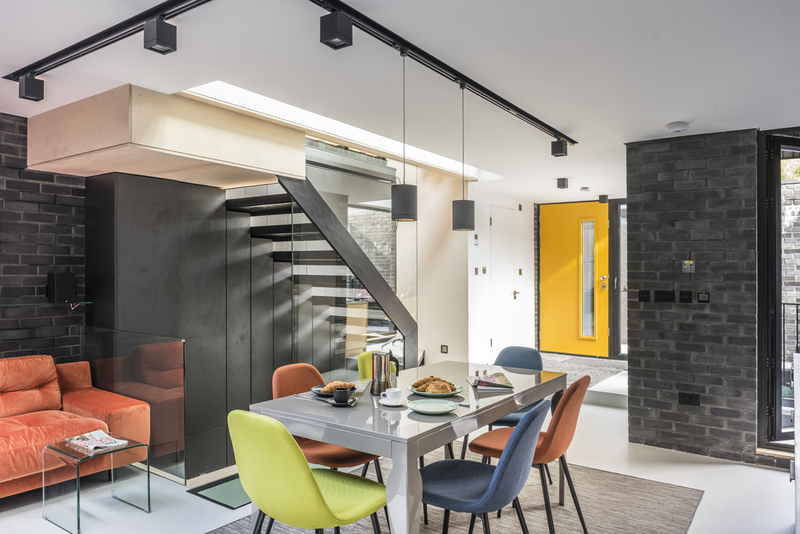 As a ‘boutique’ architecture and interior design practice, we relish the challenge of working on these extremely constrained projects, and we are constantly pushing to achieve more with less, applying the knowledge and expertise gained from smaller projects into larger commissions. 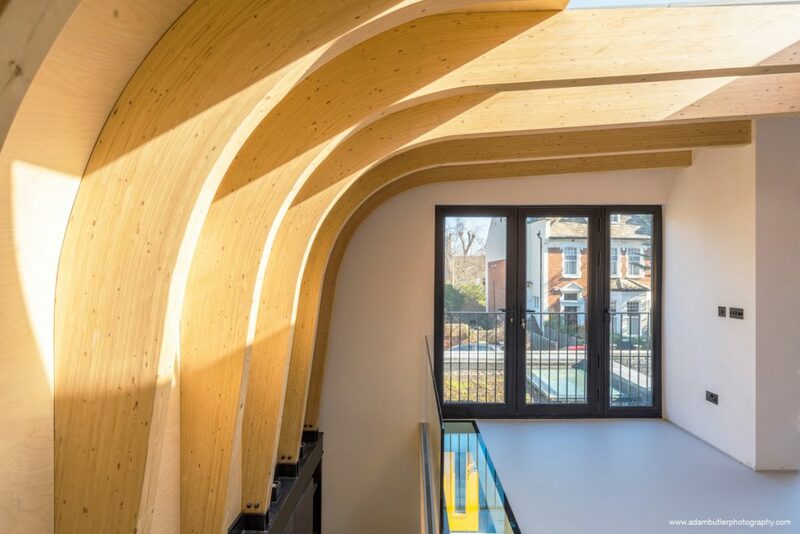 The SBID Awards are recognised globally as a benchmark for the highest quality in interior design and architecture, and having been shortlisted as finalists in the Awards in four of the last five years, we are very proud of this accolade which continues to inspire our efforts on every new project. 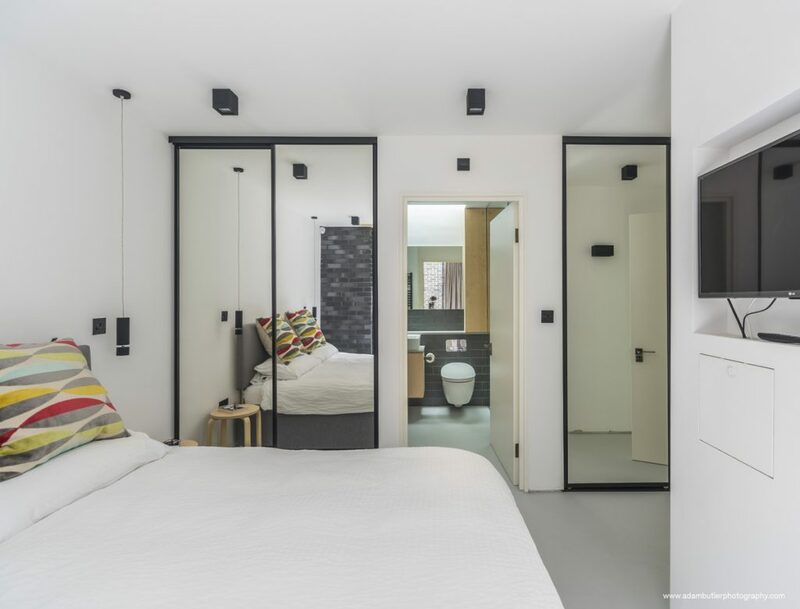 If you missed last week’s Project of the Week featuring a modern and fashionable family home which serves as a place to escape from the city bustle, click here to see more.